German medalist and master of the Prussian mint; born at Potsdam, 1754 (1752? ); died in Berlin, July 23, 1811. As an engraver he was considered one of the best of his time. Having learned the art of engraving from his father, Jacob Abraham, he soon ex-celled him in artistic execution. There exists a medal of the actor Brockmann, which is said to be the joint production of father and son. Medal Commemorating Enfranchisement of Jews in Westphalia. Abrahamson was much influenced by the designs of Chodowiecki, and sought to draw nearer to nature than did the latter, and thus avoid the dangers of too pedantic a style. On account of this the obverse sides of his medals are much finer than the reverse, which always exhibit the poverty and coldness of allegorical creation. Up to the year 1788 Abrahamson had engraved only the designs of others; then, in search of ideas and to study form, he set out for the various art centers of Europe. He spent four years abroad, and on his return most of the medals he made were of his own design. The following are by far the best of his numerous productions:"Equipping the Prussian Troops" (1778); "Peace of Teschen" (1779); "Death of Duke Leopold of Brunswick"; "Peace with Russia" (1762); "Occupation of the District of the Netze" (1772); "The King's Seventy-first Birthday" (1782); "Introduction of Silkworm Culture" (1783); "Meeting of the Monarchs at Tilsit" (1808); "Death of Queen Louise" (1810); "Enfranchisement of the Jews in Westphalia"; "The Emancipation of the Jews by Alexander I. ": the last two are known as historic thalers. He also designed and engraved a medal commemorating the death of Queen Marie Antoinette; but his greatest work was a medal bearing the bust of Frederick the Great on a stone pediment that crushes a sphinx. The legend on this medal reads, "Fredericus Legislator 1785." 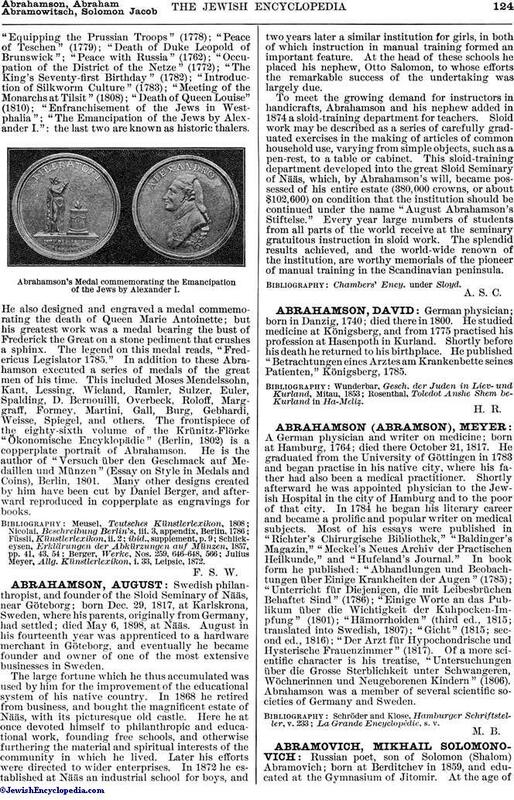 In addition to these Abrahamson executed a series of medals of the great men of his time. This included Moses Mendelssohn, Kant, Lessing, Wieland, Ramler, Sulzer, Euler, Spalding, D. Bernouilli, Overbeck, Roloff, Marggraff, Formey, Martini, Gall, Burg, Gebhardi, Weisse, Spiegel, and others. The frontispiece of the eighty-sixth volume of the Krünitz-Flörke "Ökonomische Encyklopädie" (Berlin, 1802) is a copperplate portrait of Abrahamson. He is the author of "Versuch über den Geschmack auf Medaillen und Münzen" (Essay on Style in Medals and Coins), Berlin, 1801. Many other designs created by him have been cut by Daniel Berger, and afterward reproduced in copperplate as engravings for books. 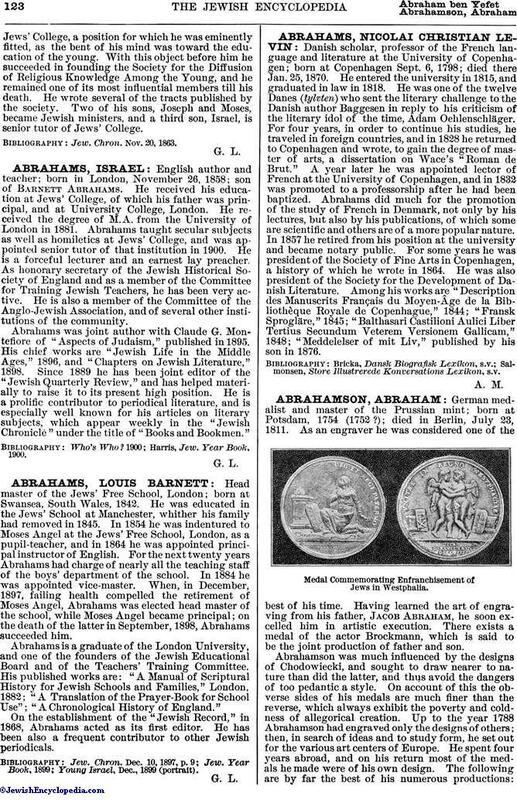 Abrahamson's Medal commemorating the Emancipation of the Jews by Alexander I.
Julius Meyer, Allg. Künstlerlexikon, i. 33, Leipsic, 1872.